Palestine’s countryside bears witness to the many cultures which have come to Palestine, some to stay and some to pass on. The Sufi shrines, once at the center of village life, represent one such culture. 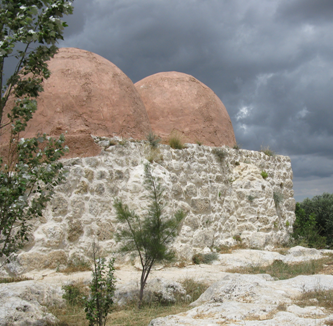 They were built as lodges for the wandering ascetics who came from the east in the 9th and 10th centuries in search of meditation and brought Islam to the Palestine’s Central Highlands. From the time of the Crusades to the end of the Ottoman Empire – a period of some 700 years – these shrines were part of a living tradition of folk religion and pilgrimage. They were often built on the sites of the Byzantine churches, Roman garrisons or prehistoric caves, and often command magnificent views of the surrounding landscape. Rozana’s Sufi Trails program invites travelers to explore this neglected aspect of Palestine’s heritage, and to discover areas of the country often overlooked by conventional tourism. These paths allow visitors to explore villages far off the beaten track and to experience the traditional hospitality of Palestinian villagers. All tours are guided and the 2 – 3 hour walking section of each tour can be arranged for all levels of hiking ability.